Intel Capital If ever there was an analogy for how technology enables man to do extraordinary things, it came on Tuesday morning and Wednesday afternoon last week at the Intel Capital conference in Palm Desert, California. At 0450 on Tuesday, the entire resort of the JW Marriott Desert Springs started moving. And moving a lot. For those that don't live in California this was an alarming experience. For locals, it was all too familiar. It was a small earthquake in the bigger scheme of things – 4.6 with an epicenter 50 miles north. But it was enough to wake most people up. And there was absolutely no impact: not on the man-made lake in the middle of the resort, or the flamingoes in the pool out front, or the enormous structures in the foyer. The next day, temperatures reached an almost blood-boiling 108 degrees Fahrenheit (42 degrees celsius): the kind of heat that makes it pretty much impossible to do anything except sit in the shade and stare at the ground. We now take it for granted that huge buildings can withstand the ground violently shaking beneath them, and extreme heat can be handled with the press of a thermostat button. But this was revolutionary technology in its day. And by that measure, come the year 2088, we will think nothing of the fact that hundreds of conference attendees arrive by self-driving flying cars that land and take-off seamlessly, with no traffic jams, and with no queues at check-in because there is no check-in. Each guest's luggage will be automatically taken to their room, and a digital assistant will already have selected the sessions likely to be of most interest to each individual. As soon as they sit down, attendees will be provided with their favorite drink (for that time of day) as they settle in to watch a vast 3D multimedia presentation beamed from the other side of the world. It may sound like the Jetsons but everything needed for that to happen was in place this week: from the drone helicopter parked out on the lawn (albeit grounded due to FAA regulations), to the advances in AI technology, to virtual and augmented reality cameras and services, to individualized apps focused on crowd control and fast service delivery. Here then are some of our favorite parts of this year's conference. The Volocopter is a weird-looking contraption: a tiny helicopter-style cockpit with a rigid circular structure above it with 18 quite small blades installed in two concentric circles. The machine uses drone technology to work and the engineers swear that it is extremely stable, as well as being much quieter and less windy than a normal helicopter. 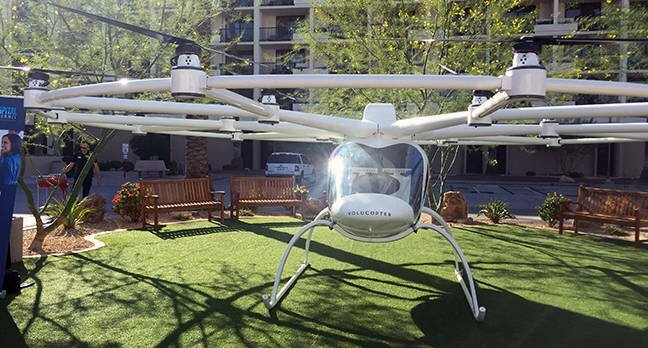 The advantage to this modern take on relatively old technology is two fold: it doesn't require the complex controls of a normal helicopter (the foot paddles are gone completely), and it can run for 30 minutes and cover roughly 30 miles powered by a big battery pack in the back. For more range the battery pack is simply switched out with a fully-charged one. The next version of the Volocopter will pull out the instruments altogether and the cockpit will be a little larger and less exposed – currently you feel like you could easily topple out of the machine if you got an ankle itch and were foolish enough to try to scratch it. The company's not going to sell them though: it wants to use them as a taxi service, and claims it will ultimately cost no more than double a normal ground-based taxi. It is surprisingly small so you could easily see getting it from an airport and landing on your hotel roof. Given the nightmare that is some cities' traffic – the two-hour trip to travel 15 miles from the center of Sao Paulo to its international airport being one of the worst – the idea of spending $100 rather than $50 and saving enormous hassle and time is very compelling. In fact, the Volocopter can't really fly anywhere and, according to our man-on-the-inside, the only reason it has been allowed to fly in public anywhere (in Germany, earlier this year) is because of the specific intervention of German chancellor Angela Merkel. So, it's all theoretical right now. But the idea is a good one and there's no reason to believe they can't get it right. As with most things drone-like, regulators are really playing catch-up right now. Talking of drones, we got a special demo of Intel drone show drones on the last night of the conferences. The company has been giving these light shows as a way to promote its technology and get people used to the idea of drones as useful and possibly even fun things. We also got a full demo of the drones technology – including software and mapping tools that Intel sells to go with its drones – from the company's VP in charge of such things, Anil Nanduri. The technology is, we must admit, pretty mind-blowing and falls just this side of magic. If ever you doubted that drones will be a big thing of the future, seeing what they are capable of doing, at far greater speed and far lower cost, will put paid to that. As for the drone show, the terrible truth that is while it was very cool in some respects – seeing complex 3D shapes made in the sky with different colored lights is a lot of fun – it's not going to replace fireworks displays any time soon. Synchronized drones are great, but they just don't have the power and noise and wow of carefully controlled explosions.